Hugh Jackman was at orientation today! You know, the guy from Kate and Leopold! Okay, maybe it wasn't him, but it looked like him! So I said, "excuse me, has anyone ever told you that you look like a movie star." I had forgotten Hugh Jackman's name so I wanted to know if he got this a lot. "Yes they have." Hugh answered. "Well, you look JUST like this actor, but I just can't remember his name...Hugh, or Hugo or something like that, do you know what I'm talking about?" I pressed on. "No, not him...It will come to me, I'll think about it." I said, completely distracted trying to think of all the movies that this guy was in. We were taking a tour of the campus, and right after we got a tour of the President's office (yeah, it's a big deal) it came to me! "Victor Hugo! That's who you look like! From Kate and Leopold and Prestige!" Luckily this guy had an iPhone and corrected me. 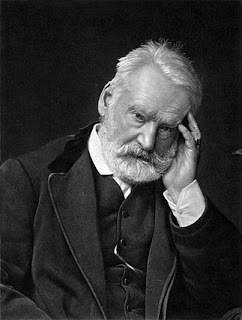 I think even he could tell he didn't look like Victor Hugo. "Hugh Jackman!" I tried again. He isn't taking my word for it and goes back to looking it up on his iPhone. "Much better than Billy Bob." He says. "I'm sorry, What's your name again? I keep wanting to call you Hugh." I make friends quickly. It's a gift.